The Nederduitsch Hervormde Church (Nederduitsch Reformed Church) establishes a congregation in Rustenburg. 16 November, A Hervormde congregation is established in Rustenburg. 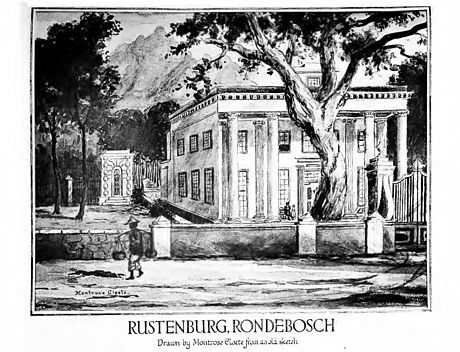 10 December, The birth of Rustenburg. 17-19 March, a full Volksraadvergadering (People’s Council) takes place in Rustenburg. To inaugurate the event a Council House is erected, with construction having begun earlier in January of the same year. A treaty with the English is ratified to avert civil war. Rustenburg’s first shop opens, an event mentioned in the minutes of the NGK meeting of 4 March 1853. 8 August, the first official Algemene Kerkvergadering van die Nederduitsch Hervormde Kerk (General Church Meeting of the Reformed Church) in Transvaal takes place in Rustenburg. The council debates its relation to the Cape Synod, and the majority vote to remain independent of the body, a decision that leads to the formation of the Dutch Reformed Church. August, Reverend Dirk van der Hoff posted to Rustenburg. Van Staden, until now acting Landdrost, is appointed on a permanent basis, a position he holds for a further 27 years. Pretorius and Potgieter agree to work together and submit to the authority of the Volksraad, at a meeting that lasts over five days. Other agreements include improvements in methods of land surveying. Paul Kruger establishes a school on his farm Waterkloof. A delegation is sent to Sekwate to warn him and other chiefs against 'smuggling' weapons. Paul Kruger is appointed a Field Cornet. June, Delegates at a meeting in Rustenburg decide to establish a congregation south of Rustenburg, to be named after the father of Hendrik Pretorius. Thus Pretoria comes into being. March, elections are held by the Volksraad, with Rustenburg allocated three of the council’s 16 members. March, The number of Volksraad members is increased to 23, with six for Rustenburg. 9 March, the Transvaal Vierkleur (four-colour flag) is raised for the first time ever – in Rustenburg. 2 February, A new Constitution is signed, bringing into being the South African Republic. Potchefstroom is made the capital. June, Every resident possessing land is compelled to pay £6 pounds per stand in tax. 10 February, Reverend Dirk Postma (1818-1890) from Holland meets with a large number of discontented members of the Hervormde Kerk in Rustenburg. More than 300 people sign up as members of a new church, the so-called Dopper Kerk (Gereformeerde Kerk). 8 October, A meeting organised by Schoeman and Andries Pretorius tries to resolve issues relating to political power. Pretorius is installed as president of the Republic, and acting president JH Grobbelaar is dismissed. Schoeman is appointed as Pretorius’s Transvaal deputy. By 1862, there are effectively two acting presidents, each the leader of rival groups vying for control of the Republic. The army of Jan Viljoen Marico marches on Rustenburg, but decides to set up camp when they learn that Kruger has arrived in Rustenburg. A clash outside Rustenburg sees Kruger victorious, the opposing sides came to an agreement, and a fresh presidential election is organised. April, An earthquake damages Reverend Postma’s church. The first postmaster is appointed. The first government school opens its doors in 1866 with TC Dekker as the first teacher. On 22 February 1866 the Volksraad ratifies the principle of town and district schools (farm schools). Mining begins in the vicinity when Henry Hartley’s claims of ancient gold diggings are confirmed by German traveler Karl Mauch. Tenders for building a permanent school are issued. By 1881 the school is closed. A German missionary from the Hermannsburg Mission Society in Germany, Lutheran Minister Ferdinand Zimmerman, buys land just outside Rustenburg. 12 April, A proclamation of annexation is announced in Pretoria’s Church Square and Rustenburg becomes the first town to see the British flag hoisted. December, The Boers decide to go to war, and Paul Kruger, Piet Joubert and MW Pretorius are elected to the leadership. 13 December, The triumvirate declare the Transvaal independent and the first shots are fired in Potchefstroom. 27 December, The Siege of Rustenburg begins, to prevent British soldiers from taking part in the war. The siege begins after the British soldiers refused to surrender a fort just outside the town, at the foot of the Magaliesberg. 30 March, The siege ends after a peace deal is signed. The Transvaal is granted self-government, subject to British suzerainty. The Pretoria Convention on 3 August 1881 formalises the terms of peace. A flour mill goes into operation by Mr Glatthaar but it is destroyed in a fire in 1886. Glatthaar, however, starts a mineral water works, an industry in operation until 1976. Writer H Rider Haggard visits Rustenburg, and makes notes on the terrain, especially a cave, which he immortalised as the pulpit in his famous King Solomon’s Mines, written a decade later. SJ du Toit is appointed superintendent of education in the ZAR. A town council is established with JGC Wagner as first chairperson and SQ du Toit as first town clerk. The town is divided into wards and 53 residents become eligible to vote for ward representatives. Paul Kruger, a resident of Rustenburg, is elected President of the Transvaal. Indians begin to settle in Rustenburg, and Ali Ismail opens the first store owned by an Indian. The Volksraad is bombarded with complaints about the presence of Indians in Transvaal towns, but despite restrictive legislation enacted in 1885, Indians continue to settle in the Transvaal. The amalgamation of the Hervormde church and the NG Church (Nederduitsch Gereformeerde Kerk) with its strong Cape influence, causes a rift in the Afrikaner community. The church is now called Nederduitsch Hervormde of Gereformeerde Kerk (Nederduitsch Reformed or Gereformeerde Church), also known as the United Church. 22 March, The first telegraph line reaches the town. Rustenburg has 22 state schools (one in town and 21 farm schools) with a total of 519 learners. Wagner & Dawes tobacco company win a silver medal for quality tobacco at the Pretoria Landbouwgenootschap. K Machol & Co is established on the southern slopes of the Magaliesberg. Plans for a railway line to Rustenburg begin after a petition is sent to the Volksraad. Although the request is turned down, a renewed demand in 1896 finds a sympathetic response. The National Bank of the South African Republic opens its first branch. The Hervormde Church takes the United Church to court regarding church property. Master-builder Karl Heyne, who arrived in Kroondal in the mid-1890s, completes the Kroondal Lutheran Church. A rinderpest epidemic affects the entire subcontinent. Despite joint efforts by Colonial and Republican governments, about 4,5-million cattle die, bankrupting farmers and halting transport, which is almost totally reliant on cattle. April, Swarms of locust destroy maize crops, and Rustenburg is also hit by a flu epidemic. 15 June, For two weeks Jan Smuts organises Boer resistance in the area after Col. Baden-Powell occupies Rustenburg. Ladysmith, Kimberly and Mafeking come under siege. The concentration camps, many in the Rustenburg area, saw 26 370 White women and children and 15 000 Black people perish. The war comes to an end with the defeat of the Boers, who sign the Treaty of Vereeniging on 31 May 1902. New African Industrials Ltd begins production of Veldt Cigarettes. The company wins prizes at various agricultural exhibitions in Cape Town in 1907 and at the Rand Show in 1908. The United Tobacco Company also begins operating in the area, buying tobacco from farmers. The colonies and Republics become the Union of South Africa. When the first World War breaks out and Smuts and Botha side with the British, some Boer leaders begin a rebellion. The army’s Commander in Chief, Beyers, tenders his resignation, and tries to mobilise Boer leaders like De la Rey to join his cause. Beyers was later defeated by Botha near Rustenburg. A flu epidemic ravages the area. July, the Rustenburg branch of the Suid Afrikaanse Vroue Federasie (Women’s federation) convenes for the first time. The decade sees residents of Bethlehem removed to the township of Tlhabane, some 5km from the centre of town. The Rustenburg Power Station begins producing power. The first attempts are made to mine chrome commercially. The Union Steel Corporation mines 400 tons of ore. The Vroue Federasie begins to run soup kitchens as the “poor white problem” becomes increasingly evident, and from1938 to 1942 the federation steps up its activities. De Kroon Platinums is established. Rustenburg produces 8.2 million pounds of tobacco, which rises to 16 million pounds in 1944, and passes the 30-million pound mark in 1950. An irrigation dam at Olifant’s Nek is completed. Smaller dams in Boschpoort (16km from Rustenburg) and Buffelspoort (24km from Rustenburg) are completed in 1933. The Catholics, active in the area since 1884, erect a church. The corporation sign three-year leases with the Kgafela-Kgatla to situate transit points in Saulspoort. The SPCA is established in Rustenburg, by a Miss Lilford. The Nationalist Party comes to power and begins to implement apartheid policy. Blacks are not allowed in the streets after 9pm, when a siren announces the beginning of the curfew every night. The Catholics establish a convent in 1950. The Rustenburg Kloof, until 1954 an open area used by locals as a picnic spot, is established as a resort for Whites. Tlhabane, already established in the 1920s, begins to see further extensions. Tlhabane was first known as Oukasie (Old Location) and was first settled by people who were later classified as Coloured. Boitokong and Hartebeesfontein are established in the 1960s and 1970s. Since they fall on the South African side of the border, they come under the administration of the Transvaal Provincial Authority. Other townships, such as Phokeng, and newly created townships Geelhoutpark, Meriteng and Monakato, fall under the Bophuthatswana government. From Rustenburg itself, people are removed to an area near today’s Sun City. From Twee Rivier, near Brits on the Crocodile River, people are moved to Rooikraalspruit. The Indians are moved out of the town centre to a site close to industrial areas, called Zinniaville. 4 January, Sanlam opens its first branch. New suburbs are proclaimed: Proteapark, Cashan 1 and Avondrust Extension 5. 23 January, Bram Fischer goes into hiding on a farm in Rustenburg. Bophuthatswana declared a self-governing state. A new party is formed to contest elections in Bophuthatswana, the Seoposengwe Party, a front for radical forces to fight against apartheid from within the system. June, Students in the surrounding townships and in the homeland emulate their Soweto counterparts. Labour unrest and attempts to unionise mineworkers accelerate, forever changing the apparently placid temper of the region. Bophuthatswana granted “independence” in 1977 by the apartheid regime, the first homeland to have this status forced onto it. Mmabatho is made the seat of government. Lucas Mangope becomes president, and in the first election his Bophuthatswana Democratic Party gains the most seats in the 96-seat parliament. Of these, only 48 are open for election, the other 48 being reserved for local chiefs appointed by Mangope. The Seoposengwe Party win six seats. July, After securing a deal with Bophuthatswana President Lucas Mangope, Sol Kerzner’s Sun International begins construction of Sun City, and the resort opens its doors on 7 December 1979. Implats at first mines the Merensky Reef, and in the early 1980s it begins to mine the UG2 chromitite layer as the technology to smelt higher chrome ore was developed. In 1968 it had acquired a mining lease over land owned by the BaFokeng, later known as the Royal BaFokeng Nation (RBN), and in 1999 it was granted a 40-year lease. Freedom Park, an informal settlement, is established after women set up shacks to sell liquor to mineworkers. Soya begins organising clean-up campaigns, closing down shebeens and taking up social issues. A country-wide State of Emergency, meant to quell unrest, leads instead to increased resistance. Union strikes increase, especially by NUM and FAWU, whose members at Rainbow Chickens are particularly active. 10 February, Rocky Malebane-Metsing mounts a coup in Bophuthatswana, taking over army barracks, police stations, the TV and radio stations, and the telephone exchange. Mangope and his ministers are all arrested, as are brigadiers, army generals, police officials and other strategic figures. By 6am, they are all in jail, except for the foreign minister, who manages to escape by jumping a fence, and seeks refuge in the South African embassy in Mmabatho. His defection gives the South African government a reason to put down the coup and invade Bophuthatswana. AWB leader Eugene Terre’Blanche proposes to stand for election for the Rustenburg seat, but eventually scuttles his plan. After farmers eject them from White farms, about 600 homeless people take refuge at the Catholic Church in St Joseph’s, just outside Phokeng. Some 200 farmers decide to come to the mission to eject the homeless people, but Bishop Kevin Dowling gets help from the police to keep the farmers at bay. The homeless people are eventually transferred to Boitokong in 1992. The ANC sets up a branch in Phokeng. 12 February, Rev Kevin Dowling is summoned to appear before Mangope and his cabinet and security force personnel. 15 March, All the members of the Phokeng ANC executive are arrested, including educationist Maggie Bopalamo. 23 November, A massive explosion at the St Joseph’s mission occurs at 2am, hours before a proposed ANC meeting. April, Rev Kevin Dowling is again summoned by Mangope, and accused of fomenting unrest. The first squatters move to Boitokong. The ANC wins the first democratic election. Popo Molefe is appointed the premier of the newly formed Northwest Province. Clashes between Sotho and Xhosa factions see 36 people killed. Establishment of Nkaneng, an informal settlement situated 40km from Phokeng next to an Amplats mine. Rev Kevin Dowling testifies at the Truth and Reconciliation Commission (TRC). October, President Nelson Mandela delivers a speech at the Bleskop Stadium in Rustenburg. December, 1500 mineworkers hand over a memorandum to Implats accusing the company of being racist.